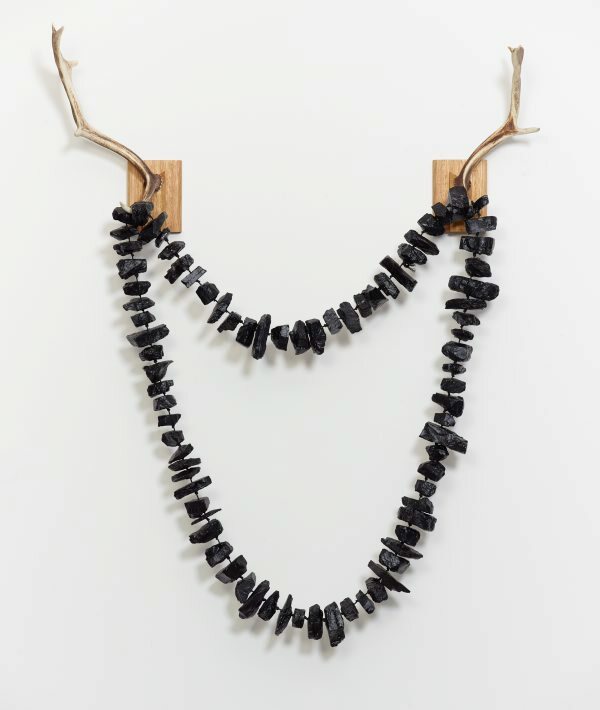 'Dark Valley, Van Diemen's Land' refers in part to the Tasmanian shell necklace tradition, my own gap in missing the inheritance of that tradition in my immediate family, and how the processes of dispossession of Country: colonisation: farming, hunting, mining are in part responsible for this gap. However, probably ironically, my maternal Tasmanian Aboriginal family and my paternal Scottish family have both worked in, and in Tasmania owned, coal mines. Dalrymple Briggs and her husband Thomas Johnson opened in 1855 their 'Alfred Colliery' -.6 km east of Tarleton, Tasmania. Today abandoned, the seam was about 600 mm thick. The family of my Scottish Grandmother, Ann Gough (neé Laird) and Laird, Dobbie, Rennie relatives worked extensively in coal mines in Lanarkshire near Glasgow up to the early 1900s. The feel of coal in my hands is compelling. Somehow familiar, I feel the pull to collect, sort, drill and thread these giant necklaces. The blackness of the coal dust is somehow disconcerting given it is not the warm charcoal of a fireplace but the darkest coldest blackness of our ancient island’s core. The weight of a coal necklace becomes more than the personal, it seems to be the shared load of our history, I walk with each one around my shoulders once it is made, before it is consigned to a crate. Dark Valley, Van Diemen’s Land is then a mute memorial, a remembrance of the grim times and an invocation to keep making one’s way forward to comprehend what happened in VDL and where we are today in Tasmania. The antlers represent the avoidance and anxiety evident across Tasmania today in terms of the mainstream unwillingness /inability to present colonial history as also Tasmanian Aboriginal history. Post 1800 Aboriginal Tasmanian history is afforded space in Bass Strait but is yet to be presented as concurrent and engaged with anglo heritage convict/colonial histories promoted in tourist Tasmania. The stories of the hunt for Aboriginal people are too close to home, too clearly connected with major landholding families to this day to be easily acknowledged outside of art.